In 2014 our company supplied and commissioned an automated mobile oil treatment unit, the GlobeCore CMM-0.6A. The GlobeCore CMM-0.6A performs removal of solid contaminates and vacuum drying of transformer oils with viscosity up to 70 cSt at 50°С/122°F. 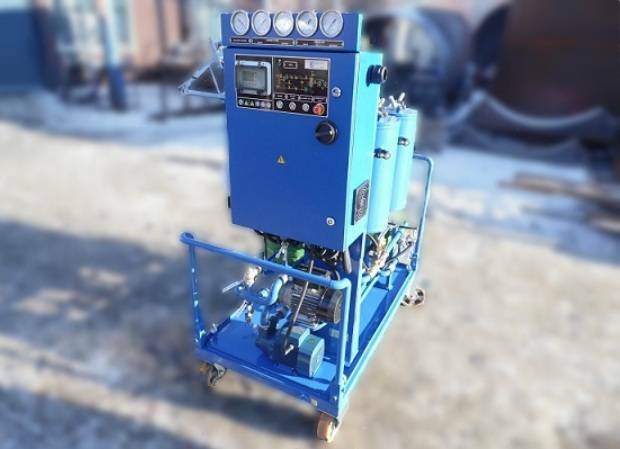 The CMM-0.6A purifies transformer oil by passing the oil multiple times through the filter section. The GlobeCore CMM-0.6A unit is completely automated. A special GSM module allows remote control of the unit by cell phone (start, stop, receipt of error messages and process parameters as a text message etc). Down time is minimized, emergency stop can be engaged without delay and labor costs are reduced. The CMM-0.6A plant can be used during installation, repairs and operation of transformers, oil switches and other similar equipment.